Five years ago, I was invited to dinner at the Vatican Embassy in Washington along with about twenty-five other bishops. 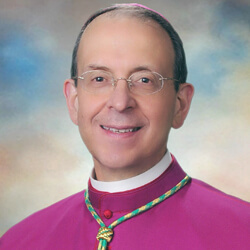 At the time I was Bishop of Bridgeport, Connecticut. And for the record on this feast of the Annunciation, the real name of the Vatican Embassy is the Nunciature and the title of the Pope’s representative is an Archbishop known as the Nuncio. At any rate, I was thinking that after a long day of meetings, it would be pleasant to have dinner at that impressive place with my colleagues. I also thought it would be an early evening. I was looking forward to getting my z’s! It didn’t take long for him to pull me into a room and true to the title of “nuncio” he made an announcement to me: “The Holy Father wishes you to go to Baltimore! Do you accept?” He didn’t give me even as much time as Mary had with the angel Gabriel. “Yes,” I stammered, “I’ll do whatever the Holy Father wants me to do.” That was my poor version of, “Be it done to me according to Thy Word.” At any rate, the Nuncio, not unlike the angel Gabriel left me and, in an instant, I found that my life had taken an unexpected turn. It is something I thank God for every day but at the time I must say I was surprised. I’ll bet you have dealt with many life-changing questions and events . . . maybe from a boss, maybe from your wife, maybe from a priest in confession. Such questions and events can take a lot of forms. Your boss in Baltimore wants you to move clear across the country to California and he wants a quick answer. You think about your family, about pulling up stakes in your community, and coming to a place you scarcely know. One day your boss offers you a promotion – a great honor, more money too – but longer hours, more pressure, lots of traveling and you hate to fly. You go to the doctor for a routine checkup and find out you’re seriously ill. Your wife tells you that she has been offered a new job in a new city, or that she’s going to have a baby, or that one of your children is ill, or that she really wants you to change something that’s gone wrong in your life. You go to confession and you’re completely honest with the priest. He shows you the way out of a sinful habit or situation and asks: “Can you do this?” “Will you?” Maybe today in prayer or confession or during one of talks, the Lord spoke to your heart and asked you a life-changing question. Maybe the Lord confided to some of you that he wants you to become a priest. Life-changing questions . . . we all get them. How do we handle them? So the feast of the Annunciation might be entitled, “Mary’s Guide for Responding to Life-Changing Questions”. ln other words, Mary shows us how to respond to life’s important questions. The only caveat is that the life-changing question addressed to Mary was completely unique and was for sure a world-changing question. So, here’s the first way to respond to unexpected questions that change everything: Get ready and stay ready. Be prepared. Keep your soul in readiness. Now, I think every artist’s portrayal of the Annunciation should be beautiful because it was an event that was full of God’s grace and beauty. But some paintings and stain-glass windows that portray the Annunciation make it appear as if all along Mary had been expecting the Angel Gabriel’s visit. I’m pretty sure that the Angel’s visit and his announcement took her by surprise: “You will conceive in your womb and bear a son and name him Jesus – he will rule over the house of Jacob forever and of his kingdom there will be no end.” How could she possibly be ready for an announcement like that? Mary was surprised, she had questions, but she was ready, and how? Mainly because she let God work in her soul – and work he did. He kept her free from original sin and all personal sin. But Mary didn’t know that at the time. All she did was to pray, and to pray deeply, so deeply in fact that ancient Christian writers tell us that Mary conceived the Word of God in her heart before she conceived him in her womb by the Holy Spirit. If we want to be ready for those life-changing questions & events, we need to pray. Even if mired in some problem or discouraged or see no way out-we need to pray. The first temptation the devil throws at us is to give up prayer. Can’t you just hear him say, “Why pray? You’re unworthy. God won’t listen to you!” Mary had no idea what God would ask of her but she allowed God to cultivate her soul. She absorbed the Word of God. She prayed. She lived her faith to the hilt. Ask Mary to help you get ready and stay ready for whatever may come your way. So the second pointer Mary gives us on responding to life-changing question is: Know what the stakes are for you, for your family, and others. There’s a great homily that St. Bernard of Clairvaux preached in the 11th century. He made himself the proverbial “fly on the wall” at Mary’s Annunciation. He imagines himself eavesdropping as the Angel pops the questions to Mary and he finds himself urging her to hurry up and answer the Angel quickly, and why? Because he knows how high the stakes are: The salvation of the world depends on her answer. “Answer quickly!” he says to Mary. “Answer with a word, receive the Word of God”… As if to remind Mary of the stakes, he goes on: ‘Adam is waiting for you! Abraham is waiting for you! David begs it! All the children of Adam are waiting for this! The whole of humanity is waiting!’ …no pressure there! So when confronted with a life-changing question, let’s think not just about ourselves but about who else will be affected by the answer we give – especially our families but many other people besides. What spiritual goods hang in the balance? Will my decision help others to find the Lord or give them an excuse to turn away? Will my response strengthen or weaken the faith of others? Mary did not foresee what the angel’s announcement would mean for her life. What she did know is that God had a plan and that she was part of it… None of us will be as central to God’s plan as Mary but we’re part of his plan. As Bl. John Henry Newman wrote: “God has created me to do him some definite service. He has committed some work to me He has not committed to another . . . I am a link in a chain, a bond of connection between persons, He has not created me for naught . . .” We might not know what part God wants us to play in his plan of salvation but we can be sure that it has something to do with what Gabriel said to Mary – the Good News that “God so loved the world that he sent his only Son that whoever believes in him should have eternal life” (John 3:16). Mary’s third piece of advice for responding to life-changing questions is obedience to God’s holy will. So, with readiness of soul and a readiness to cooperate with God’s plan, Mary responds to the angel: “Let it be done to me according to Thy Word.” Here is Mary in complete obedience to God’s saving will. “Let it happen in me as you say!” “Thy will be done on earth as it is in heaven!” Isn’t that what we say every day when we pray the Our Father? Yet when we’re confronted with a difficult choice that could change us for the better we become like old Ahaz in the first reading who hemmed and hawed… who wouldn’t even ask God for a sign and wore out everybody in the process. That how not to respond! “Let it be as you say!” – This is how we are to respond! This is how we give God permission to work in us and through us. Almost 700 years ago, St. Catherine of Siena, a wise and holy woman whose love for God changed the course of Church history, wrote this: “If you are what you should be, you will set the world on fire” . . . “If you are what you should be, you will set the world on fire!” Brothers, we’re called to set the world on fire by living our faith & vocation to the hilt and God will send us the life-changing questions and events to help us do just that. Are we ready? Do we know what the stakes are? Will we do his will? God bless you! God keep you always in his love!